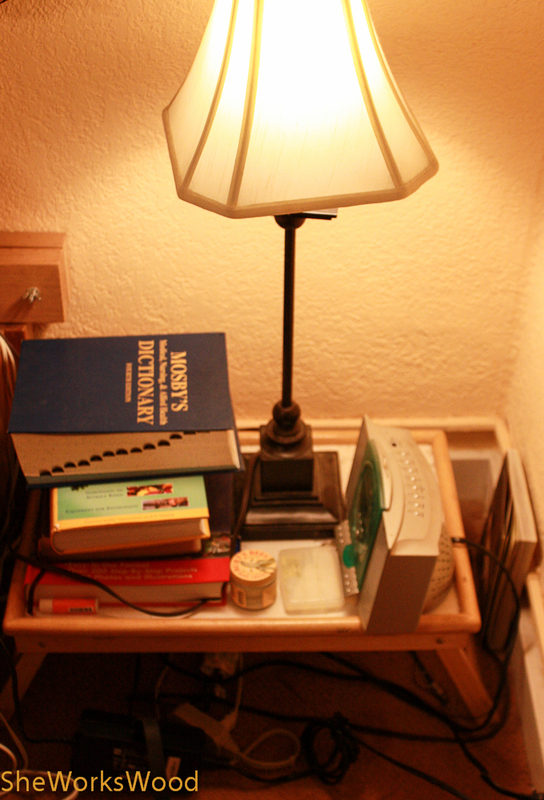 Somethings just can’t wait ..
Don’t know if you remember this shot, but obviously, I need a bedside table. So here it is .. with out the drawer. I’ll make the drawer some time this week and post a final glamour shot. But I wasted no time putting it to use and I’m very happy to have it. 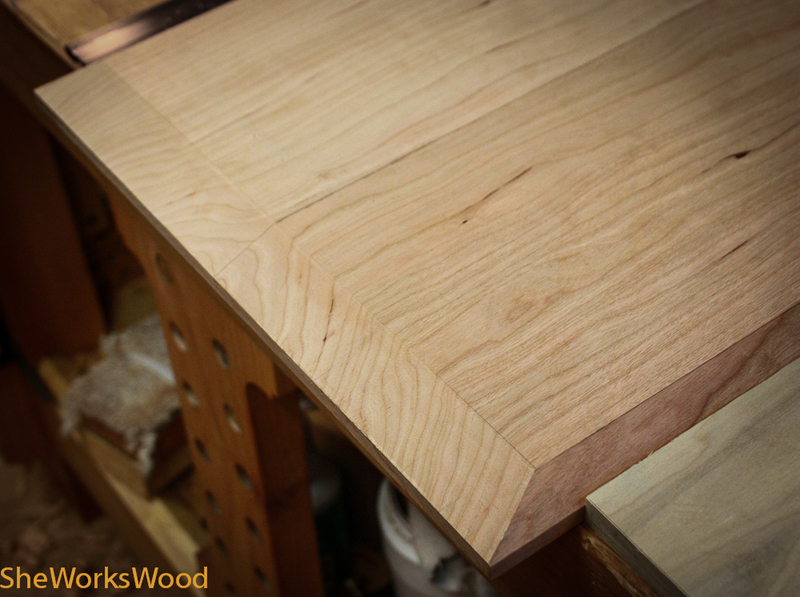 The nice curly cherry if used for the door is a hand picked board from Hardwood To Go (Shannon Rogers). Finish is shellac under Daly’s Pro Fin. 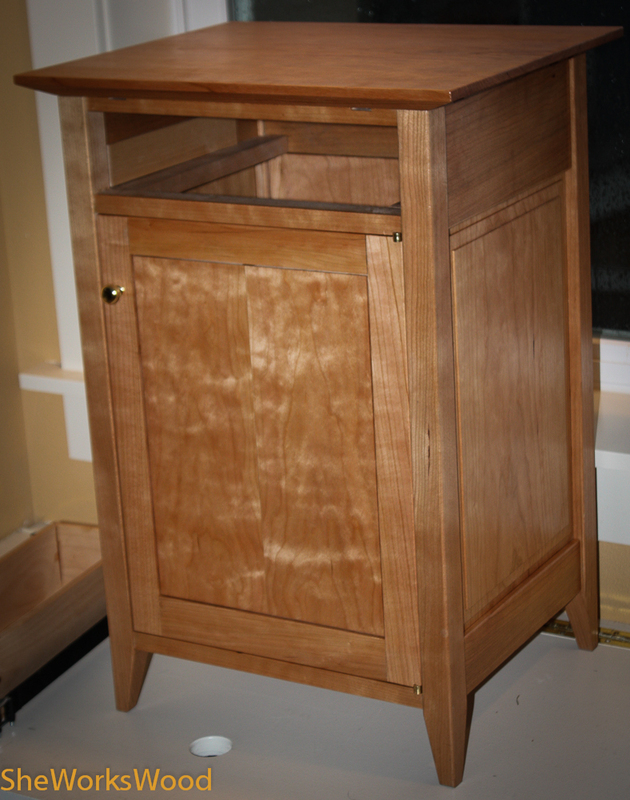 I beveled the top with my hand planes and then finished the cabinet with shellac and Daly’s ProFin. 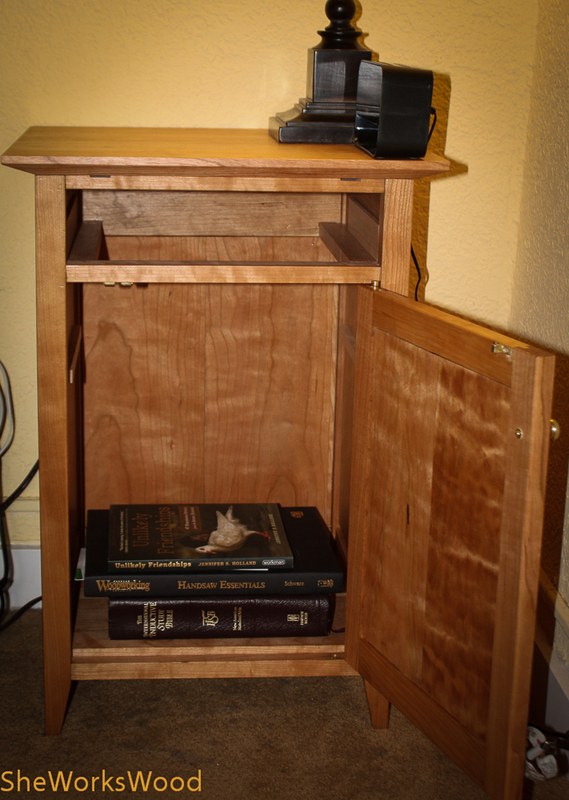 On last shot of cabinet in use. 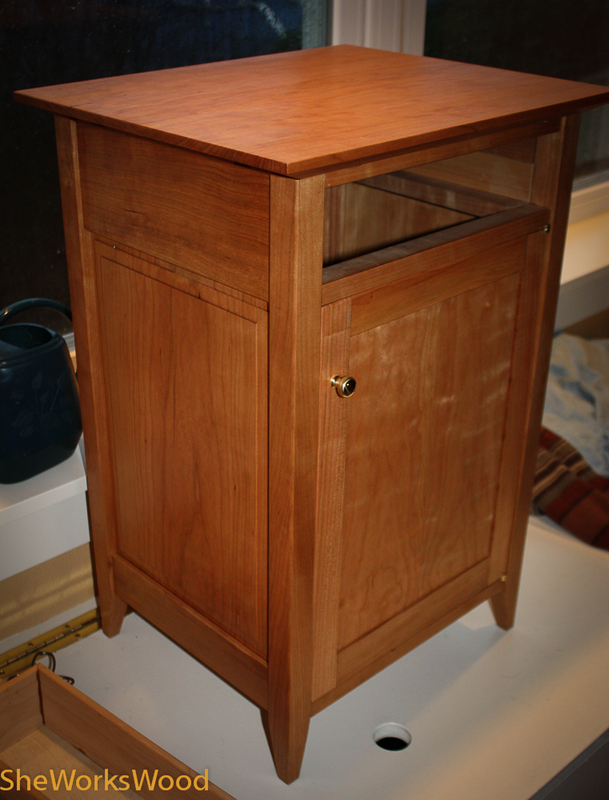 This entry was posted in bed side table, cherry, curly cherry, Edensaw, Hardwood to Go and tagged bed side table, bedside table, curly cherry, Hardwood to Go. Bookmark the permalink. 12 Responses to Somethings just can’t wait ..
she works wood realy good! I decided to hang the nail cabinet I’m making without the drawers, just to get it out of the way. 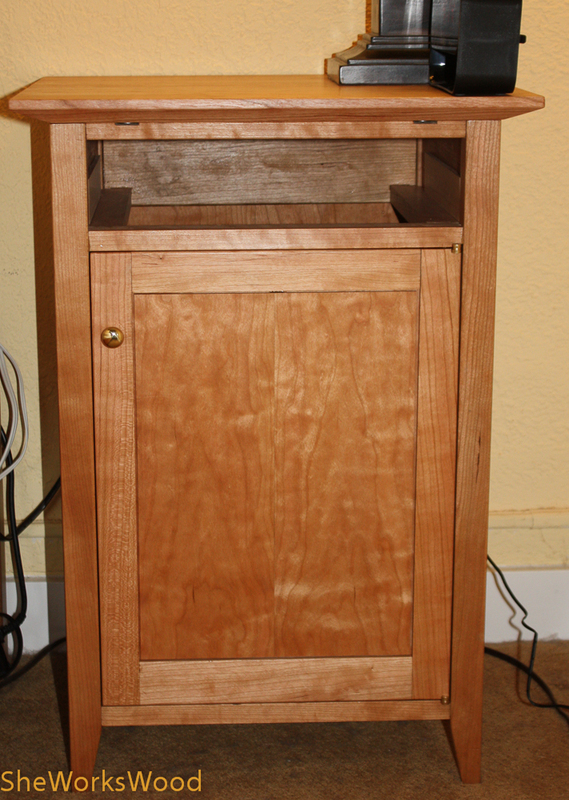 I need to get cracking on the drawers now. Thanks! I’ll probably bring the table back into the shop for the drawer. I still need to wax the top and I’ve been giving the finish lots of time to completely cure. I love the top. How long did it take you do it by hand? I’m thinking of using this technique on my dresser but the top is 65″ long. It’s way too long (i.e. “high”) for the table saw and I can’t think of a way to manage it with the track saw. Hand methods seem like the only way to go but I’ve never done it before. Any help is appreciated. Thanks Marilyn. I’m with you on doing this on the table saw .. Yikes!! I’ve seen it done on the band saw to remove most of the waste and then finish with hand planes. You angle the table or build a jig that creates the angle. I’ve done this several time and found it to be .. well .. fun! You could practice on a scrap first and make sure you have the hang of it. Don’t forget to do the end grain first. You’re the best. Those are great articles and just what I was looking for. I have been waiting to see this door ever since I shipped off that piece of Cherry. Do you think you have enough left to make a drawer front out of it? Really great work Marilyn!